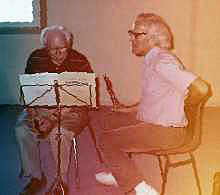 Elliott Carter and Robert Aitken in Villeneuve-lez-Avignon, France during the week of the world première of Scrivo in vento (July 20, 1991). Boosey & Hawkes: click on "Composers"
Bernard, Jonathan W. "The Evolution of Elliott Carter's Rhythmic Practice," Perspectives of New Music 26/2 (Summer 1988): 164-203. ________. "An Interview with Elliott Carter." Perspectives of New Music 28/2 (Summer 1990): 180-214. ________. "Spatial Sets in Recent Music of Elliott Carter," Music Analysis 2/1 (1983): 5-34. Boretz, Benjamin. "Conversation with Elliott Carter," Perspectives of New Music 8/2 (Spring-Summer 1970): 1-22. Carter, Elliott. The Writings of Elliott Carter: An American Composer Looks at Modern Music. Compiled, edited, and annotated by Else Stone and Kurt Stone. Bloomington, IN: Indiana University Press, 1977. Derby, Richard, "Carter's Duo for Violin and Piano," Perspectives of New Music 20 (1981-82): 149-68. Dufallo, Richard. "Elliott Carter" (interview). In Trackings. Oxford and New York: Oxford University Press, 1989, 269-85. Edwards, Allen. Flawed Words and Stubborn Sounds: A Conversation with Elliott Carter. New York: W.W. Norton & Company, Inc., 1971. Garrison, Leonard. "Elliott Carter's Scrivo in vento," The Flutist Quarterly XIX/4 (Summer 1994): 86-92, andXX/1 (Fall 1994): 75-80. ________. "Three Late Works by Elliott Carter: An Analysis and Flutist's Performance Guide." D.M. Document, Northwestern University, 1993. Glock, William. Notes in Advance. Oxford and New York: Oxford University Press, 1991. Harvey, David I.H. The Later Music of Elliott Carter. New York: Garland, 1989. Mead, Andrew W. "Pitch Structure in Elliott Carter's String Quartet No. 3," Perspectives of New Music 22 (1983-84): 31-60. Northcott, Bayan. "Elliott Carter," in The New Grove Twentieth-Century American Masters. New York: W.W. Norton & Company, Inc., 1988. ________. "Elliott Carter at 80," The Musical Times 129 (December 1988): 644-47. Porter, Andrew. "Thought-Executing Fires." The New Yorker, 9 May 1983, 114. ________. "Riches in a Little Room." The New Yorker, 24 December 1984, 62-64. ________. "Preludes to Felicity," The New Yorker, 13 June 1988, 92-93. ________. Music-Makers, The New Yorker, 11 November 1991, 78-82. Rosen, Charles. The Musical Languages of Elliott Carter. Washington: Music Division, Research Services, Library of Congress, 1984. Schiff, David. "Carter's New Classicism," College Music Symposium 129 (1989): 115-22. ________. "Elliott Carter's Harvest Home," Tempo 167 (December 1988): 3-13. ________. The Music of Elliott Carter. 2nd Ed. Ithaca, NY: Cornell University Press, 1998. Spencer, Patricia. "Regarding Scrivo in vento: A Conversation with Elliott Carter," The Flutist Quarterly XXXIII/4 (Summer 2008): 18-27.